Navigating the ever-changing landscape of health care can be challenging and, sometimes, a bit intimidating. Yet, understanding the various components of not just health, but also overall wellness, can empower patients to advocate for their own health – something providers certainly appreciate and recommend. Starting with understanding that distinction between health and wellness – and utilizing new medical technologies and clinical research trials – patients can, now more than ever, take control of and effectively manage their physical and spiritual wellbeing. 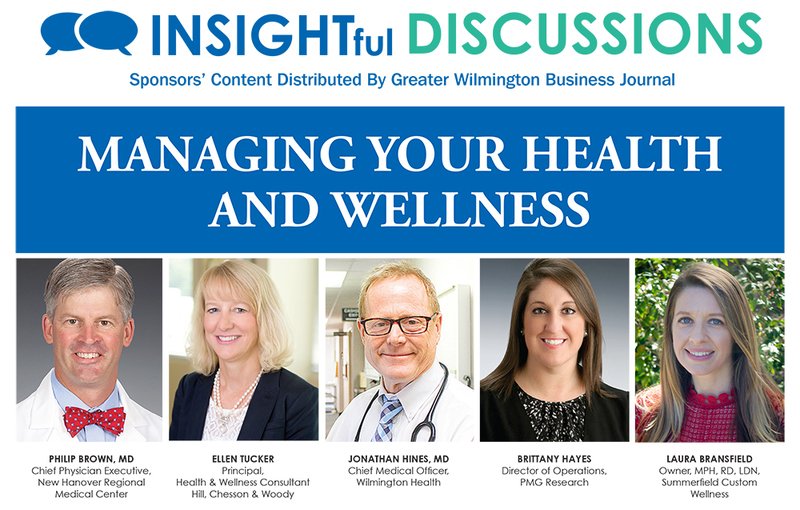 We asked five local industry experts to discuss the importance of balancing health and wellness, as well as share their advice on seeking preventative and comprehensive care. Why is it important to distinguish between health and wellness? LAURA BRANSFIELD: I like to think of wellness as active choices we make to improve our health and wellbeing. We aren’t always in control of our health; some illnesses and injuries are unavoidable. On the other hand, wellness is something that is in our control because it is related to our choices, behaviors and lifestyles. Wellness is doing the best and feeling the best that we can, regardless of the cards we’ve been dealt. We can decide to eat nutritious foods and be physically active. We can make an effort to manage stress, get adequate sleep and take better care of ourselves. Wellness enables us to take control and live life on offense. ELLEN TUCKER: Health is a status or tangible experience, and wellness is more of a concept. Both show a relationship to the physical dimension of wellbeing. Employers’ understanding of wellbeing is evolving. A growing number of employers realize that this state of human comfort, health and happiness reflects the whole person, and only by engaging the whole person can they motivate the highest possible productivity. While there may be a need to address the core elements of a total wellbeing strategy individually – including financial and career, as well as physical and emotional – they are all interdependent. That’s why a holistic approach to wellbeing that strengthens all these elements makes sense. In fact, it’s a hallmark of destination employers. BRITTANY HAYES: Health is the current state of your body and wellness is, to me, more of a mentality of how you’re going to treat your conditions or promote better health and lifestyles, so that, in the long run, your body and even mental status are in a better place overall. JONATHAN HINES: In general understanding, health means absence of disease, while wellness has come to encompass an entirety of habits, lifestyle choices, psychosocial integrity and environmental stressors that ultimately impact health. It is dynamic and is recognized to have socioeconomic determinants, as well. In this context, there are people with outwardly good health but poor measures of wellness that put them at long-term risk, such as poor diet, psychosocial stress, financial instability, smoking and other substance use. PHILIP BROWN: There is more to a person’s wellbeing than their clinical health indicators, though wellness does impact health. Wellness encompasses social and emotional factors, including whether a person feels supported or is lonely or threatened. It can mean a person is at peace with who they are and their circumstances, even if their body is not perfectly healthy. At NHRMC, we are looking at these wellness factors and trying to incorporate them into our care plans for individuals. We also want to be a partner in promoting our community’s wellness. How do health and wellness intersect and/or impact each other? HAYES: When a person is more engaged in their overall wellness and has done the research on options of how to better care for their body, then their overall health is going to be at an advantage. They really need to know the treatments that are out there. It may be more than just seeing one health care provider; it could be seeing multiple health care providers and talking about options that are available to them, such as clinical research. HINES: Wellness addresses many things that can be acted on by people that ultimately improve health. Making healthy choices and becoming actively engaged in understanding what personal changes promote wellness and prevent development of common diseases is impactful. People can make changes at the individual level. At a larger scale, increased education broadly in the community about the meaning of wellness and the larger societal and even political choices that we make ultimately can impact the health of whole populations. There can be a lot of things for a patient to do to optimize the condition of their health: the necessary compliance with medical regimens; prevention initiatives; regular visits with their doctors who know their conditions well; monitoring of chronic illnesses; and successful communication with their trusted providers regarding how they want to be cared for and how the field of medicine is changing. All these things will optimize health and, ultimately, a patient’s overall wellness. BROWN: Growing evidence suggests that social environments impact health. For example, living in a highly stressed situation leads to what’s called toxic stress, particularly if a child grows up in it. The health of that child can be negatively impacted for a lifetime. This is revealed through higher rates of heart disease, diabetes, substance abuse and depression. That’s why NHRMC is working with others in our community to identify toxic stress and work toward alleviating it. We also know that having insecure sources of healthy food, safe housing and social support systems can prevent a person from getting medical help and taking good care of themselves. Last year, we launched Our Community Link, an online resource to help connect people with the social services and discounted programs available to help them. The response has been tremendous, and many of our community partners are getting involved in taking and making referrals through the system. TUCKER: Many factors impact health, including genetics, lifestyle choices, access to care and environment. They intersect at individual choices. Total wellbeing (physical, social/emotional, career, financial and community) is the goal, and these can be influenced by an individual’s lifestyle choices and behaviors. How do they influence? Your health will be compromised if you are solely focused on improving your physical wellness and are lagging in social/ emotional, career/purpose, financial and community wellbeing. For example, chronic stress has a direct correlation to long-term health issues. An individual can be stressed in any or all the dimensions of wellbeing. How important are nutrition and fitness to overall health? HINES: Both have an increasingly recognized role in disease prevention and treatment of diseases. Nutrition is always a critical component in an individual’s overall health. Frankly, we are what we eat. This becomes even more important if an individual has chronic illnesses, such as hypertension or diabetes. Nutrition belongs in the routine discussions going on between patients and their physicians. Fitness is critical, as well. Regular aerobic exercise reduces the risk of heart attacks, makes it less likely to get hypertension or diabetes, reduces stress, reduces weight and strengthens bone and muscle, just to name a small portion of the benefits that can be achieved. TUCKER: Nutrition and fitness are essential to obtaining a positive health state. The bigger question is, Where does one find the motivation for behavior change? Again, total wellbeing (physical, social/emotional, career, financial and community) is the goal and these are all influenced by lifestyle choices and behaviors. Furthermore, lifestyle choices and behaviors are influenced by an individual’s motivation. Nutrition and fitness are essential to one’s overall health but what’s even more important is the motivation to eat well and move more. BROWN: Nutrition and fitness are crucial for overall health. We believe that overall health is four-dimensional, encompassing mind, body, spirit and connectivity. Both nutrition and fitness may affect all four dimensions. Studies have shown that the symptoms of many chronic health problems can be diminished through a nutritious diet and regular, vigorous exercise. We can make a difference in the lives of the next generation by supplying them with healthy food choices, engaging them in active play, and modeling healthy behavior. BRANSFIELD: As a Registered Dietitian and owner of a nutrition counseling practice, I can talk about this all day! The human body requires a variety of nutrients to grow, repair itself and sustain healthy organ function. Most people know the common nutrition-related diseases, such as diabetes and heart disease, but many people do not realize the role nutrition plays in almost all symptoms and disease states. When we are not getting what we need from our diets, we can experience a multitude of symptoms, including fatigue, digestive discomfort, pain, migraines, brain fog, hormonal imbalances or a sluggish metabolism. I do not believe that there is one way of eating that is best for everyone, but I can confidently say that when people become mindful, listen to their body and are balanced and consistent with their choices, nearly all of them realize a positive, noticeable difference in how they feel. I always say that nutrition might not solve everything, but until you get your nutrition in check, it is almost impossible to know which symptoms are caused solely by inadequate nutrition and what is left over that needs to be explored. Nutrition interventions can turn some symptoms around very fast and, at least to some extent, most people have the power to make changes to their diet and activity level. Lastly, to this point, considering the medical creed to first do no harm, there are very few circumstances where changing one’s diet by increasing fruits and vegetables would cause more harm than good. Nutrition is a fast and accessible way to improve health. Of course, we all know that physical activity is vital for overall health, but I do think it is a harder sell than nutrition. There are very few people who are physically active but not conscious about healthy eating and there are tons of people trying to eat healthy that do not exercise regularly. How are health and wellness providers addressing societal determinants, such as stress, in diagnosis and general care? BROWN: We are truly beginning our journey to fully understanding the positive impacts we can make on the health of our community and ourselves by addressing these issues. Presently, we are screening for food insecurity, housing stability and toxic stress. When we find patients who need assistance, we work to connect them with all resources from which they might benefit, thus enhancing overall health. HINES: To me, “health and wellness providers” means any primary care providers (that and a fair number of the specialist providers, as well) – basically any doctor taking care of patients with chronic illnesses and, hence, in a long-term relationship with the patient. A patient’s level of societal stress must be understood by the provider to fully appreciate the medical outcomes going on with the patient. Poorly controlled stress and anxiety can lead to chronic illness and treatment failure. A well-established relationship with a patient and a provider is the most efficient way to recognize stress as medical care is given over time. It is crucial that the provider knows the patient well and can then gauge the level of stress contributing to the patient’s health and address accordingly. BRANSFIELD: In our practice, we are always addressing societal determinants because they have such a significant impact on our health and wellbeing. Discussing these matters with patients helps ensure that we are providing the support and resources that are most impactful for each of them. We are in a unique position as nutrition counselors because we are not under the same time constraints as physicians. Most family practice doctors have less than 20 minutes per patient, and many visits are related to an acute issue or illness. This makes it difficult to discuss concerns, such as stress, environment and economic stability, or provide resources in these areas. One interesting development has been the role of new initiatives through health insurers in the past few years. Many commercial payers are introducing wellness programs and offering benefits, such as telephonic counseling, to provide resources to people in need. There has also been a rise in care coordinators and nurse navigators, which help ensure follow up with at-risk patients. Some programs go as far as covering groceries, air conditioning and home improvements. The willingness of health care companies to take on additional costs for prevention to avoid more health complications in the future demonstrates how important social and societal determinants are to health. TUCKER: The wellbeing conversation must be adopted by carriers and service- provider solutions to accommodate for these types of societal determinants. An emergence of mentorship and leadership training of all levels (leadership, mid-level managers and the workforce). It’s becoming more imperative that we are providing the right training, tools and resources for these leaders, therefore making a more significant impact on the workforce in return. Resiliency, mentorship, EAP [Employee Assistance Program] types of training, so that leaders of all levels are able to address employee’s needs (e.g. stress, purpose, general care) and contribute to their physical, social/ emotional, career, financial and community wellbeing at the time they need it most. Complex care navigation for diagnosis. Telemedicine for general care and even telemental health for behavioral health-related concerns. HAYES: I think that there is a real focus on population medicine from our medical community in the area. Clinical research can be a piece to solve that problem and help with a broader outreach to patients that may not be coming into see physicians regularly due to cost of care. Clinical research is no longer taking place in a silo; it’s becoming a part of patient care and the health care provider’s daily practice. Providers can give their patients another care option to potentially reduce that stress. What role does ongoing research play in improving overall patient care? TUCKER: Research provides new treatments and drugs that can cure disease, prolong life or improve quality of life. An exciting example of emerging research is regarding precision medicine and the ability to use genetics to more effectively treat certain areas of disease (Genomics). One outcome will be the ability of providers to choose the right drug for the right patient at the right dose. HAYES: Just in our community, there are a lot of opportunities for patients to participate in a clinical trial. We have seen that patients that are participating in a clinical trial are seeing improvements in their overall health – for example, A1C [glucose test] levels decreasing and patients coming off medications because they are under a closer watch than those patients not involved in a research trial. Clinical research has also shown to increase physician satisfaction scores from those providers that are participating in research. Patient satisfaction scores are also higher from those patients that are participating in research trials. So, I think that the value of clinical research to the patients and the providers are a really important factor to improving overall patient care. As research becomes more embedded into health care institutions, the physicians are more aware of all the trials that are available to them and their patients. I think a big piece of that is just educating the community on what participating in a clinical trial is really all about. We’re catching some momentum with health care institutions across the region and the U.S. on the importance of clinical research involvement, but this is something we’ve been doing at PMG for years. We really have an evolved and mature system in place, and we’re continuously looking for ways to improve and grow. The culture here at PMG is not just a mission statement; it’s really something that we have embraced and grown, and something that our patients can see and feel in the community, as well. HINES: At Wilmington Health, we have a robust research program that is available to all our patients. What we’ve found is that patients engaged in research often see side benefits to their involvement, ranging from additional patient education and reduced medication costs over the short term to actual improved long-term control of their health problems. We believe that this is due to the active engagement in their health by patients and the extra health care “touches” afforded them by research involvement. BRANSFIELD: Research is the lifeblood of health care! Obviously, clinical research is critical because it provides new insight for treatments and cures. Beyond clinical research, there has been an emphasis on behavioral and consumer research related to health care that has been incredibly powerful, as well. This research helps health systems and providers understand the patient experience and levels of satisfaction, so they can strive for improvement beyond clinical care. It also provides insight regarding patient compliance and behaviors that impede success. As medical science evolves, and we learn more about the psychology behind patient behaviors, health systems and practitioners will be better equipped to continually improve patient care. Our favorite research involves a field called functional nutrition and integrative health. This is research into the synergies of the body, or treating the body as an interconnected web and not as individual parts. Integrative health goes even further to say that how we view our body, our outlook on life and the quality of our relationships are as important for optimal health as nutrition and physical activity. This research will improve patient care because it will put the patient in the driver’s seat and empower us all to be our own experts and find our own healing, with the health care providers alongside us supporting the journey. BROWN: As technology gets more sophisticated, we are increasingly able to capture, analyze and act on data to inform care decisions. We can identify where there are health disparities, learn more about why those disparities exist, and develop solutions. We can also identify best practices in medicine to eliminate unnecessary variation, deliver consistently high-quality care, and reduce the cost of care. In addition, it is now well-documented that patient participation in clinical research leads to better health outcomes at lower cost, and often with the benefit of increased connectivity between people with common ailments. This phenomenon works as a direct positive impact on connectivity, one of the four dimensions of health. What are three preventative measures you recommend to maintain optimal health? HAYES: From my point of view, it’s really important for people to be engaged in their own health care. Also, being aware that clinical research is an opportunity for patients, as it could improve a person’s overall health. I recommend that people speak to their physicians about trials that are available and do their own research about what clinical trials they may qualify for. BROWN: First, using our four-dimensional model (mind, body, spirit and connections), fueling health through proper nutrition with active lifestyle is important. Second, from a disease prevention/ early treatment standpoint, immunizations and recommended age-appropriate annual screenings are a major key. Finally, for prevention and arrest of damage, stopping smoking is likely the single most impactful lifestyle modification one can make. TUCKER: Establish a medical home, where you have a trusted physician or health care provider. Accept that you have a role in your health. Health does not happen to you. You can make a difference in your health. Be proactive in learning and practicing a healthy lifestyle. Start with basics: eat clean, move more and get enough sleep! HINES: Maintain optimal weight and exercise at least 30 minutes daily. Work on a diet high in fresh fruits and vegetables, with avoidance of simple carbohydrates and trans fats (i.e. margarine and tropical oils). Stay engaged in your community and strong relationships, and follow your physician’s advice about screening and prevention. We commit ourselves to standards of prevention outlined by the USPSTF [U.S. Preventive Services Task Force] and other authoritative specialty and primary care professional societies to keep our patients healthy and detect diseases at their earliest stages. We monitor patients closely through our electronic health record and reach out to them when we find gaps in their health preventative metrics. We use tools in the electronic health record to remind providers as they are going in to see the patients of any gaps in the preventative services. We publish these standards on easy-to-access electronic data sites for our providers to keep up with the latest recommendations. While it is hard to rate the importance of one preventative measure over another, certainly the cancer screening programs (breast, colon, cervical, etc. ), as well as smoking cessation programs are of the utmost importance. Eat colors, lots of them. Is preventative care playing a larger role in employer health care plans? TUCKER: Preventive care is an important component of employer health care plans. Generally, preventive care is covered at 100 percent, at no cost to the member due to health care reform. Some employers include preventive care compliance in their wellness program to improve compliance. The goal is to keep employees healthy and identify any issues early when they can be treated. BRANSFIELD: The preventative care guidelines that were enacted as a result of the Affordable Care Act [ACA] have had a significant impact on employer health plans and patient care. In fact, we altered our business model as a result of the ACA, helping more people reach their health goals. Prior to the ACA, most employer health plans covered four annual visits with a Registered Dietitian but afterward, many health plans opened to unlimited visits with $0 copay. As a result, our practice had more opportunity to explore worksite wellness programming because the burden of cost was off the employer and employees; it was now just part of their benefits package. When there is no visit limit for someone in need, we can help them on a deeper and more impactful level and, in return, we have seen incredible results! There is nothing more fulfilling than success stories of patients who no longer feel ill after their meals, reduce or eliminate their medications, or reach a healthy weight for the first time in 20 years. So much of this patient success is possible when nutrition counseling is considered a preventative service. HINES: I think all organizations that are footing the health care bill are recognizing the importance of preventative care. It is well shown that preventative measures can improve the wellbeing of patients and reduce the overall cost of health care, apart from improvement for the employer in terms of productivity of a healthy workforce. BROWN: Preventative care will continue to grow in importance for employers and others who want to drive better health and lower costs. NHRMC has had a very robust preventative health program for our employees that includes support for those with chronic conditions, a 24-hour fitness center that continues to grow in attendance and activities, and a nutrition program to teach employees how to prepare healthy meals. As the emphasis on prevention matures, we will begin to think in terms of preventative health rather than preventative care. At this point, a dramatically decreased cost of health care should come to fruition. What are the benefits of patient engagement technologies, such as online portals and text notifications? HINES: These newer technologies are improving the communication between patients and providers. Nothing could be more important. It improves patient engagement, improves compliance with recommended treatments, and fosters trust between the patient and provider. These types of connectors between health care organizations and the general population is heralding a frameshift change in how we will be interacting in the future. The patients are and will demand this kind of availability in the healthcare they receive. BROWN: Anything we can do to make health care more accessible benefits the patient’s health and wellbeing. We have e-visits and virtual visits now as options in some of our practices. These take travel barriers out of the equation and are a lower-cost option for engaging with a provider. Patients can also better manage their health information through portals, such as NHRMC MyChart, and get reminders for important screenings and services. BRANSFIELD: The introduction of these technologies has really helped patients take control over their care and experience. Patients now have instant access to their own medical records through online portals, which makes coordination of care much simpler. In today’s digital society, patients can appreciate the ease of online scheduling, appointment reminders and instant lab results. Technology has been particularly useful for Summerfield Custom Wellness, as our online patient portal incorporates telehealth appointments, online intake paperwork and a food journaling app for patients. These tools help our patients and dietitians stay connected and provide an enhanced level of support. HAYES: There’s so much technology available to patients, and companies are continuously improving and inventing new technology, but I think this really helps people be more cognizant of what’s happening with their body and how they can take control of their own health. There are so many clinical trials that are developing new devices to help people be more informed. I think everything in the medical community is so fast-paced that a patient really needs to take charge of his or her own health. So, with all of those new technologies that are in place – the new app on the Apple Watch, the patient portal that you have 24-hour access to – benefits the patient and makes them more engaged. TUCKER: Patient engagement technologies improve access to information and provide a way to communicate with your provider. There can be reminders, including text notifications regarding appointments and taking medications. This technology is also being adopted by wellness vendors to improve patient experience via online messaging, text messaging and phone calls. What are the challenges of such technologies? BROWN: With any new service, adoption is the biggest challenge. Patients need to feel comfortable sharing and accessing their health information electronically. In many areas of the region, there are also challenges with broadband connectivity. BRANSFIELD: The challenges of these technologies are the same as all others. Although our portal software is great when it works, there are many times when messages are not sent or are stuck in spam filters, intake forms time out without saving, or the system goes haywire during a new software update. It would be a dream if these technologies only had the benefits and did not also come with potential patient frustration and interference with rapport-building. As a small business, another challenge for us is cost. Of course, there are more advanced technologies and more quality systems available, but they are made for large clinics and hospitals, making them out of reach for Summerfield and other private practice groups. The options that are affordable in the private practice realm are all similarly disappointing. TUCKER: Not everyone is computer literate or has a smart phone. There can be generational issues regarding use of technology, as well. While such technologies are a great resource, they cannot become the only form of communication. HINES: The greatest challenge is for the technology to be appropriate for the need – that the acuity and complexity of the need by the patient is appropriate for the ability of the provider to evaluate it through the technology used. There are situations where face-to-face presence of the provider and patient is absolutely integral to problem-solving a health issue, and newer communication technologies are insufficient for the interaction. Other challenges exist around payment models for substituting technology for a traditional provider visit. There may be instances where telemedicine or portal use may be the most cost-effective for the patient but place the provider at a greater financial risk. How could the rise of digital providers and virtual doctors impact medical care and/ or the health care industry? HAYES: Some of the things that we’ve seen in research are monitors that people are wearing that send in real-time data, where they don’t even have to come into the office. I think this is a way to catch the people who maybe would not have come in to see the health care provider for various reasons. This is where the digital providers and technologies can all kind of come into play, and we have a better overall picture of what our community looks like from a medical perspective. Getting specialist physician advice into the more rural settings, where there is a shortage currently. Giving immediate access to patients for straightforward problems that could safely be handled without physically touching the patient. Getting specialist physician consultation into the hospitals where no such specialist exists, for example, “telestroke” medicine. Reducing the cost of care by improving triage to appropriate high-value services and avoiding unnecessary low-value/ high-cost services for the patient. TUCKER: Virtual doctors improve access to care by providing convenient care at an affordable cost for certain types of care. Virtual visits are used for minor illnesses that don’t require ongoing care. It does not replace the need for a primary care physician. We may see an increase in virtual visits for mental health, which provides a convenient and private way to receive such care. It can also address primary care physician shortages in certain areas, such as rural locations. BRANSFIELD: There are so many benefits to the rise of telehealth, including accessibility, affordability and convenience. Our practice utilizes HIPAA-compliant video chat for easier access to care. We meet with some patients frequently in the beginning as they get their bearings with their new healthy lifestyles, and many patients live in rural areas with a long commute each way. Telehealth helps give those individuals access to care that they may otherwise not receive. It’s also very helpful for people who have busy schedules or the times that we have inclement weather and it is not safe to travel. BROWN: The rise of digital providers and virtual doctors will reduce the importance of location. The college student who has gone away to school could continue to interact with their hometown doctor. Residents of rural communities will have greater access to physicians who live farther away. Also, in an emergency like Hurricane Florence, people who can’t travel can still reach out to providers who can answer questions from wherever they are. After Florence, providers with NHRMC Physician Group did just that. When people have increased access to care, in whatever form, they’re better able to manage their health. How has the shift to value-based care continued to impact patients and medical providers? HINES: For patients, a shift to value-based care has provided a growing expectation for transparency of cost and quality, with the hope of moving toward a health care system that meets them where they are and increasingly focuses on evidence-based care. This shift has also had a tremendous impact on providers. While medical providers have always placed a premium on the quality of care they give their patients, a move to value-based care has demanded measurable metrics and closely tracked the burden of cost to the health care system, with a dramatic increase in documentation burden. While there is concern about potential contribution to physician burnout, the increased focus on value for our patients and evidence-based care also appeals to our professionalism as health care providers. BROWN: Patients and providers have become much more cost-conscious while still pursuing excellent care. In fact, pushing for the highest quality of care is the optimum path to value. Patients with high-deductible health plans are looking more closely at the cost of care and how they can bring it down. On the provider side, we are also looking at the overall cost of caring for a person – which means helping them manage their health and the social determinants of health – to prevent complications. It also means being more attuned to the cost of medications, whether there are lower-cost options for a patient, and the costs of tests and supplies. At NHRMC, we’re driving clinical excellence and consistency by carefully studying these opportunities to continually improve the value of the care we provide for patients as they move from care in our physician practices to our hospitals and then to our post-acute settings with home care and outpatient services. We’re looking at the big picture for coordinating care, rather than individual episodes of care. HAYES: Clinical research is a big portion of the value-based care. Patients that are involved in clinical research are more engaged in their overall health and wellness. We can see that their satisfaction scores are higher than those that are not involved in research and it is improving patients’ outcomes. Clinical research providers have higher physician satisfaction scores compared to those providers that do not participate. The cost of care for a patient enrolled into a clinical trial is also lower compared to a patient that is not involved in research. TUCKER: Value-based care is a delivery model that pays providers based on patient outcomes, rather than a fee-for-service model, where they are paid based on the amount of services they deliver. This should reduce unnecessary tests and procedures. It is a shift to paying for quality versus quantity. Patients benefit from the focus on quality. How can patients advocate for their own health and wellness? BRANSFIELD: When it comes to your health, you have to be your own advocate! I learned this firsthand through my own health journey, and I continue to advise my patients of this daily. The health care system in our country is complicated and expensive, and it is easy to slip through the cracks. It is not possible for our doctors to know everything going on with our health when our visits only last a few minutes. As individuals, we are responsible for our own health and wellness; there is no one who will intervene or support you unless you are driving that effort. My best advice is to find a provider you trust – someone who listens to your concerns, helps you address them and guides you to resources. Ask questions when you have them and don’t give up when you reach a roadblock! It may take some time to build this relationship with your provider, or you may need to try a few different providers until you find the right fit. But once you do, you will feel empowered and supported. Another great way to be an advocate for your health is to keep detailed records. Health care providers love data and if health histories or lab results are missing or incomplete, it is difficult to help our patients without reinventing the wheel. I love when someone shows up at my office with a paper trail of their health journey. It means we can pick up where they left off, instead of wasting time and delaying the healing process even more. HAYES: Patients can be advocates for their own health by being more educated, and knowing that clinical research and participating in a clinical trial is an option for them. Asking their physicians if there any research studies to participate in – or contacting the local research group in town – is definitely a way they can take control of their own health and wellness. And even looking into the future – maybe your participation in a clinical trial will not benefit you directly, but maybe it will years down the road. It could improve the health and wellness of your children and grandchildren and help advance medicine just by participating in a clinical trial. TUCKER: Change your mindset from wanting someone to tell you what to do. Make good decisions and take accountability for your own health. Do your own research, track your care and ask questions. Create a trusted relationship with your provider and know that you have choices. You are a consumer of health care, as you are in other decisions. BROWN: The patient is at the center of the care team. They are in charge. Patients should let their providers know what’s important to them. Sharing their goals, their obstacles and their questions can help the medical team create a much more personalized care plan, and lead to improved health and wellness. HINES: Find a provider you trust and who communicates well, who is willing to discuss your broader wellness and will actively discuss what you can do to feel better and improve your health. Take an active role in finding out what you can do to learn about your health, medications and preventative measures you can take. Providers should enthusiastically support your efforts in this. It is also important to note that your elder family members may benefit from help in advocating for themselves with their health care provider, particularly where frailty and multiple health problems are involved.